The ongoing petition against Chuck Berry's animal abuse gig has proved to be an overwhelming success. We would like to thank all fans, promoters and artist representatives who have signed the petition. Please continue to do so as long as the Pamplona date stays on the schedule. showing there is no room for animal abuse in Rock'n'Roll music. schedule which have both been updated. Both these Legends are active supporters of animal rights. show at San Fermin Festival of Pamplona. As every half-decent educated European knows, San Fermin is probably the worst bullfighting festival in the world. Chuck Berry as the only major musical act in years (NO Jerry Lee Lewis, Little Richard, Fats Domino, Bo Diddley, Ray Charles etc. have EVER played this festival) has sadly agreed to play this festival (www.sanfermin.net). in the media associated with bullfighting. fans are obviously not worth it to get their questions answered. We have already received an tremendous amount of messages by fans from all over the world that are disgusted by this decision. So far no official statement has been made by Chuck Berry or his associates. "Someone so inhumane as to promote this type of event OUGHT to wear that red shirt and suffer the consequences." "It seems an icredibly stupid thing for the participants too." "I and many fans are horrified that Chuck Berry has apparently agreed to play at the disgusting bullfighting festival in Pamplona, in which animals are tortured and then killed for spectator sport. Please cancel this gig immediately." Chuck Berry's European Tour July 2008 has been cancelled. More details on possible reschedulements and refunds soon. BO DIDDLEY's funeral held in Gainesville, FL today (Saturday) rocked and rolled with as much energy as his music. For four hours, friends and relatives sang, danced and celebrated the life of the man who helped give birth to rock and roll with a signature beat that influenced Buddy Holly, Elvis Presley, the Rolling Stones and many others. As family members passed by the casket, a gospel band played his namesake song. Within moments, the crowd of several hundred began clapping in time and shouting, "Hey Bo Diddley!" "In 1955 he used to keep the crowds rocking and rolling way before Elvis Presley," BO DIDDLEY's grandson, Garry Mitchell, said before kicking his legs sideways, high up in the air the way BO DIDDLEY did on-stage. Mourners cheered. "I'm just telling it the way it is", he said. BO DIDDLEY was remembered for much more than his songs. Friends recounted his generosity, manifested in concerts for the homeless and work with youth groups and other charities; and the way he loved to talk to just about anybody he met. Gainesville Mayor Pegeen Hanrahan referred to one of his most famous hits as she told the crowd, "When the question is asked, "Who do you love? ", it's you, Bo". Rock singer Eric Burdon attended the service and flowers were sent from musicians including Jerry Lee Lewis, Tom Petty, George Thorogood and others. Last night's "Free Fridays" concert at the Downtown Community Plaza in Gainesville, FL was the first of a month-long series of concerts celebrating National Black Music Month and also marked the unofficial beginning of a weekend celebrating the life of BO DIDDLEY. David Ballard, event coordinator with Gainesville's Department of Parks, Recreation and Cultural Affairs, hosted last night's concert and began proceedings with a special acknowledgment of BO DIDDLEY and his legacy. We have posted a YouTube video in the BO DIDDLEY-The Originator website Forum of a 2-minute radio interview from last Monday with ZZ Top guitarist Billy F. Gibbons, paying tribute to BO DIDDLEY. This and other tribute videos and comments are available in the BO DIDDLEY-The Originator website Forum, located at http://members.tripod.com/~Originator_2/guestbook.html and then by clicking on the "Enter My Forum" button. Top radio personality Jim Ladd paid tribute to BO DIDDLEY this week with a 90-minute live special broadcast on 95.5 KLOS-FM Classic Rock in Los Angeles that included phone calls from George Thorogood and drummer John Densmore of The Doors. UK singer/composer Peter Gabriel, speaking to BBC Radio, paid tribute to BO DIDDLEY thus: "He appears in a lot of writing that I've done over the years because of the groove with which he was associated, which is the "Bo Diddley rhythm". He was really one of the first people to make an African element a central part of pop music and it was done with a lot of feel and a lot of style. I was sad to see him on the departed list". Gabriel also spoke on BO DIDDLEY's legacy: "It'll be songs using that rhythm, which is great. I mean, to be remembered by a groove - I hope that people visit his grave, they'll hear it". Rock singer Eric Burdon paid this tribute: "Bo's one of the guys who invented rock 'n' roll. He took two cultures that existed in separate forms - country and western and the kind of blues that used to be known as "race music" - and put them together. His beat was a jungle beat. That's what he called it". couldn't make it. The death of Bo is very sad, because it means there are only two of the truly rock 'n' roll originals left - Jerry Lee Lewis and Chuck Berry. Everyone who is into rock 'n' roll knows the Bo Diddley riff - he was a real legend". Paul Barrett, former manager of the popular UK singer Shakin' Stevens, had this to say about BO DIDDLEY: "Bo was really incredible. At one gig in London some rockabilly kids turned up with a Confederate flag and Bo wondered what was going on. I explained it was nothing to do with racism - they just liked Southern music. Bo insisted on having a picture taken with them because he said the folks back home wouldn't believe the story otherwise". a place like this were doing there, it was what you always dream of seeing and experiencing - a master, at the top of his game". A celebration of BO DIDDLEY's life, featuring members of his touring band and guest musicians. 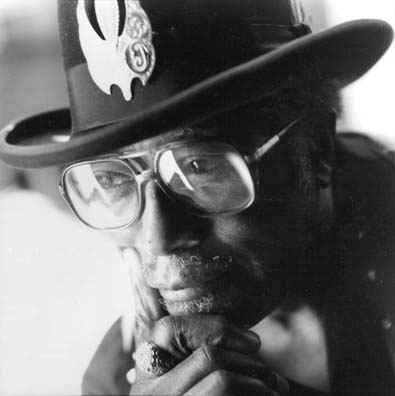 It is with profound regret that we announce that BO DIDDLEY died of heart failure on Monday June 2nd 2008 at his home in Archer, FL. He was 79. He had suffered a heart attack in August, three months after suffering a stroke while touring in Iowa. He had returned to Florida to continue rehabilitation. We mourn the passing of our friend Ellas McDaniel, the man known around the world as BO DIDDLEY. One of the founding fathers of rock & roll, a truly unique talent and an influence upon generations of musicians, Ellas' commitment to issues close to his heart, including human rights, the state of the Nation, homelessness, unemployment and the importance of education, touched many people across America and beyond. Born to entertain, he was a man of great innovation and energy. The BO DIDDLEY beat, his trademark square guitars, his pioneering use of female musicians and his exciting and highly idiosyncratic performances over five decades, form part of his lasting legacy. Ellas leaves behind his devoted family, their fine families and fans and admirers around the world that join them in honoring a good life of kindness and musical vision.